Schematic representation of the circle of Willis, arteries of the brain, and brain stem. 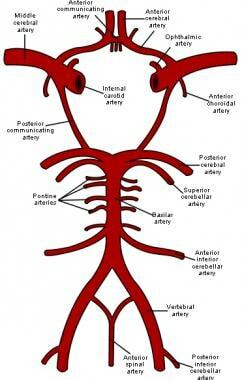 Numerous small vascular channels can be seen around the circle of Willis. These are perforators and anastomotic branches. The pia mater may also have reticular conglomerates of small vessels. People with moyamoya disease have been found to have a higher incidence of elevated thyroid antibodies. While this is an association in some individuals, the significance is not clear. However, it suggests that immune abnormalities may play some role in moyamoya disease. These associated conditions may not be causative, but they do warrant consideration due to their impact on treatment. In the presence of these risk factors, the condition is referred to as moyamoya syndrome. A study indicated that the prevalence of moyamoya disease in California and Washington was 0.086 case per 100,000 people. In this study, the breakdown based on ethnicity as ratio to whites was 4.6 for Asian Americans, 2.2 for African Americans, and 0.5 for Hispanics. The incidence of moyamoya disease is highest in Japan. The prevalence and incidence of the disorder there has been reported to be 3.16 cases and 0.35 case per 100,000 people, respectively. Moyamoya disease occurs primarily in Asians but can also occur (with varying degrees of severity) in whites, blacks, Haitians, and Hispanics. Death from moyamoya disease is usually from hemorrhage. The outcome of the disease depends on the severity and nature of the hemorrhage; the prognosis depends on recurrent attacks. Mortality rates from moyamoya disease are approximately 10% in adults and 4.3% in children. About 50-60% of affected individuals experience a gradual deterioration of cognitive function, presumably from recurrent strokes. Patients with moyamoya disease who present for treatment while symptoms are evolving have a better prognosis than do those who present with static symptoms (which probably indicate a completed stroke). Janda PH, Bellew JG, Veerappan V. Moyamoya disease: case report and literature review. J Am Osteopath Assoc. 2009 Oct. 109(10):547-53. [Medline]. Mineharu Y, Takenaka K, Yamakawa H, et al. Inheritance pattern of familial moyamoya disease: autosomal dominant mode and genomic imprinting. J Neurol Neurosurg Psychiatry. 2006 Sep. 77(9):1025-9. [Medline]. Mineharu Y, Liu W, Inoue K, Matsuura N, Inoue S, Takenaka K. Autosomal dominant moyamoya disease maps to chromosome 17q25.3. Neurology. 2008 Jun 10. 70(24 Pt 2):2357-63. [Medline]. Kamada F, Aoki Y, Narisawa A, Abe Y, Komatsuzaki S, Kikuchi A, et al. A genome-wide association study identifies RNF213 as the first Moyamoya disease gene. J Hum Genet. 2011 Jan. 56(1):34-40. [Medline]. Ma J, Liu Y, Ma L, Huang S, Li H, You C. RNF213 polymorphism and Moyamoya disease: A systematic review and meta-analysis. Neurol India. 2013 Jan-Feb. 61(1):35-9. [Medline]. Kim SJ, Heo KG, Shin HY, Bang OY, Kim GM, Chung CS. Association of thyroid autoantibodies with moyamoya-type cerebrovascular disease: a prospective study. Stroke. 2010 Jan. 41(1):173-6. [Medline]. Im SH, Oh CW, Kwon OK, et al. Moyamoya disease associated with Graves disease: special considerations regarding clinical significance and management. J Neurosurg. 2005 Jun. 102(6):1013-7. [Medline]. Uchino K, Johnson A, Claiborne S, Tirschwell DL. Moyamoya disease in Washington State and California. Neurology. 2005. 65:956-958. [Medline]. Kim JS. Moyamoya Disease: Epidemiology, Clinical Features, and Diagnosis. J Stroke. 2016 Jan. 18 (1):2-11. [Medline]. Kronenburg A, van den Berg E, van Schooneveld MM, et al. Cognitive functions in children and adults with Moyamoya vasculopathy: a systematic review and meta-Analysis. J Stroke. 2018 Sep. 20(3):332-341. [Medline]. Li H, Zhang ZS, Dong ZN, et al. Increased Thyroid Function and Elevated Thyroid Autoantibodies in Pediatric Patients With Moyamoya Disease: A Case-Control Study. Stroke. 2011 Feb 24. [Medline]. Kim T, Oh CW, Bang JS, Kim JE, Cho WS. Moyamoya Disease: Treatment and Outcomes. J Stroke. 2016 Jan. 18 (1):21-30. [Medline]. Starke RM, Komotar RJ, Hickman ZL, et al. Clinical features, surgical treatment, and long-term outcome in adult patients with moyamoya disease. Clinical article. J Neurosurg. 2009 Nov. 111(5):936-42. [Medline]. [Full Text]. Fung LW, Thompson D, Ganesan V. Revascularisation surgery for paediatric moyamoya: a review of the literature. Childs Nerv Syst. 2005 May. 21(5):358-64. [Medline]. Scott RM, Smith JL, Robertson RL, et al. Long-term outcome in children with moyamoya syndrome after cranial revascularization by pial synangiosis. J Neurosurg. 2004 Feb. 100(2 Suppl Pediatrics):142-9. [Medline]. Hoffman HJ. Moyamoya disease and syndrome. Clin Neurol Neurosurg. 1997 Oct. 99 Suppl 2:S39-44. [Medline]. Cohen N, Berant M, Simon J. Moyamoya and Fanconi's anemia. Pediatrics. 1980 Apr. 65(4):804-5. [Medline]. Gosalakkal JA. Moyamoya disease: a review. Neurol India. 2002 Mar. 50(1):6-10. [Medline].